for again but a gift in this time! I just couldn't not to draw her! >///////< She's sooo airy! Beautiful work!! I love the clean lines! She is really pretty! Good work! She looks very pretty Nice work. Aaa this is so pretty!! 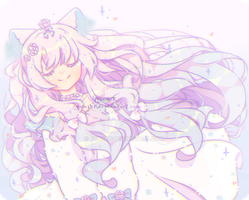 * O * I really love the soft color palette.